Dean Kamen was born in the state of New York in 1951 to Jack and Evelyn Kamen. His father was a comic book illustrator and his mother was a teacher. He was a bright child, but he did not do well in school. He got into trouble with his teachers because he didn't show his math calculations on his papers. He could see them in his head, and it seemed pointless to write them down. He was more interested in studying scientific texts of Sir Isaac Newton and Galileo. Many of his later inventions came from these interests. When he was 16 he offered to redo the lighting at the Hayden Planetarium, but the director paid him no attention because of his youth. He designed a system and hooked it up anyway in the museum. The director was impressed. Dean got the job and made light shows for four museums for $8,000. Then he started making light boxes for rock bands and while he was in college he was making $60,000 a year at his business. He did all the work in the family basement. His brother Bart, who was in medical school, suggested a pump that would deliver medication automatically. Dean invented it and doctors from all over the world wanted them. One order was for 100 pumps at $2,000 each. His family and friends helped put the pumps together. He called his company Auto Syringe Inc. He was just 20 years old. When he needed more room for equipment, he sent his parents on a vacation, jacked up the house, had the basement enlarged and equipment installed. Then he had the house set back down on the foundation. He hired professors and college students to help with development. They created all kinds of pumps to deliver medication to patients, including insulin. The business kept growing until they had to move to a commercial building. There was a need for a portable kidney dialysis* machine. After five years of experimenting Dean and his engineers made a new machine weighing only 22 pounds that people could use at home instead of going to a hospital every few days. He was attending college, but finally dropped out after five years because his inventions and business ventures were taking up all his time. He moved the business with its 100 employees to New Hampshire. He still couldn't meet the demand for the medicine pumps so he sold the company for $30 million. Kamen bought an old brickyard which was by the Merrimack River. This would house his new company DEKA (DEan KAmen). On December 3, 2001 Dean Kamen revealed to the world an invention he had been working on for a year and a half. He said it would revolutionize the world and have an impact similar to the automobile. People were trying to imagine what it could be. It was unveiled on the Good Morning America show on television. It had two wheels, a platform on which to stand, and a T bar to hold onto. It didn't fall over because of a gyroscope* inside it. Millions of dollars had gone into its development. It was called the Segway, a people transporter which today is used by tourists, workers, and policemen to travel around. 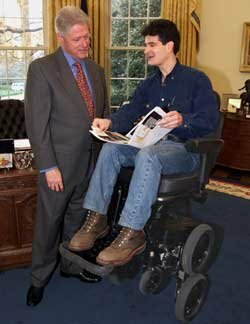 Earlier he had invented a wheelchair which could go over curbs, travel on any terrain, and climb stairs. It also would remain upright on two wheels, making it possible for the rider to be on eye level with people around. While they were developing it, the machine sometimes gyrated around as if it was dancing. They named it "Fred" after Fred Astaire, the famous dancer. By 1999 he had put $50 million into developing the wheelchair and it still wasn't finished. It was such a secret project that only authorized personnel at DEKA had seen it, and those working on it could not discuss it with anyone outside the group. The engineers working on the project eventually reaped sizable financial rewards. They had been calling the wheelchair "Fred" during the development stage, but when it was completed it needed a grown-up name, so they called it iBOT. It was introduced on the television show Dateline. For Christmas one year his engineers made a small version of the iBOT wheelchair and put a Darth Vader doll on it. When activated the doll said, "This is not a wheelchair. It's an extraordinary machine". From that invention of the wheelchair came the Segway,* which initially was called by the code name "Ginger". Work continued on it for months. Dean expected to build about 22 million machines at a few thousand dollars apiece. Their manufacturer wanted to make it "any color, as long as it was black", (similar to Henry Ford's early manufacture of cars). Of course the Segway marketing people wanted to offer it in 200 colors. They ended up making it in white, black, sage, and silver. The sale of Segways has not met Dean's expectation. Less than 50,000 have been sold. They said Ginger would be useful as a recreational vehicle and as a fun way for students, golfers, and tourists to get around. They also planned for professional people such as policemen, mail delivery people, and workers in warehouses to benefit from it. The Fort Worth Opera presented a modern-day version of the Mikado in which two of the characters wheel around the stage on Segways. With his new found wealth he built a house in New Hampshire and also one next door for his parents. He bought an island called North Dumpling Island which is off the coast of Connecticut, but is within the territory of New York State. 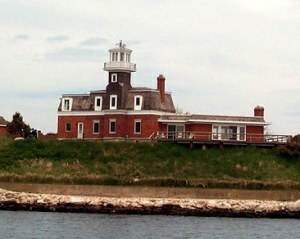 The island had a house and a lighthouse. He created a make-believe kingdom. He called himself Lord Dumpling, wrote a constitution for his new "nation", created some currency,* and made a postage stamp. He even had a national anthem sung to the tune of America, the Beautiful. Keep lawyers far from thee! That we may all be free! He bought a helicopter which he called his magic carpet. He thought he could improve the helicopter, so he bought the company and made the improvements. Kamen had a rule that no one would lose a job for causes that weren't their ethical or professional fault. When hard financial times came, he absorbed the cost himself to keep everyone employed. In 1999 the company did not do well and he mortgaged his house to get the money to pay bonuses to the engineers and employees at DECA. Dean saw the devastation of soldiers who were returning from combat with missing arms and legs. He wanted to do something to help them, so he and his engineers developed an artificial arm which would work like a real arm. The person using it could pick up small objects and even feed himself/herself. He considers his most significant invention to be a water purifier which will supply clean water to third world countries. He contends that bad water kills so many people every year that he compares it to the Biblical giant Goliath which David fought. He even calls his invention the Slingshot. As David used a slingshot to fell the giant, so Kamen wants to put "slingshots" into the hands of 4 billion people to slay the giant of bad water. The water distillation* is powered by a machine which uses cow dung for fuel. It would have few moving parts and the distiller and power source could be placed in a village for a cost of about $5,000. If the village had electricity they would only need the distiller which would cost about $1500 and would produce 1000 liters of fresh drinking water a day using any kind of water you put into it; dirty water, sea water etc. Some have called him a modern day Thomas Edison. Dean Kamen holds patents on 440 inventions while Edison had 1093. Both men have had a significant impact on the world.
" If you build castles in the air, your work need not be lost, that is where they should be. Now put the foundations under them." This biography by Patsy Stevens, a retired teacher, was written May 23, 2011.
to move smoothly from one place to another. Two of Kamen's inventions were named "Fred" and "Ginger". Press "Go" to search for books about Inventors. This page displayed 37,861 times.